​"So we beat on, boats against the current, borne back ceaselessly into the past." The definitive biography of one of the most admired women in America. She was born Maria Jana Korbelova in Prague just before the outbreak of World War II, the first child of Czech Jewish parents. Almost sixty years later Madeleine Korbel Albright was sworn in as the U.S. Secretary of State, the first woman to hold the position. Here is the story of her dramatic life and rise to power in this meticulously researched biography that expands on the ground-breaking research by Washington Post reporter Michael Dobbs who, in 1997, first pieced together the incredible and nearly lost history of Albright's early life. At the age of two, Madeleine was saved from almost certain death by being whisked to freedom after Hitler's invasion. More than two dozen close relatives died in Nazi camps. In an attempt to protect themselves and their family from further persecution, her parents kept silent about their Jewish roots, raising their children as Catholics. Dobbs traces Albright's progress from a European ghetto to the corridors of power in Washington. 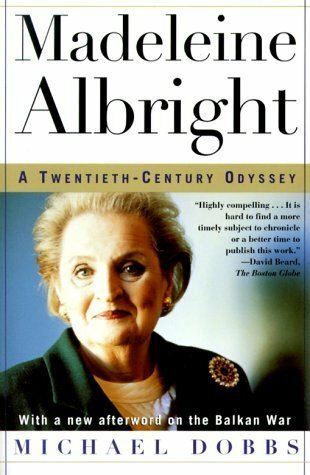 He shows how Albright's life has been shaped by the great events of our times: the rise and fall of Nazism and communism, the Holocaust, the women's movement, and America's ascent to superpower status. Madeleine Albright is a tragic but ultimately triumphant tale of a woman's struggle against adversity that reflects the experience of millions of American immigrants. Michael won the 1997 George Polk Award for International Reporting for tracing Madeleine Albright's Jewish roots and connections to the Holocaust. "In his superbly researched book, Michael Dobbs has performed a significant service in bringing together the threads of a life that reflects major themes of the twentieth century...It is a rigorous and important book." -- Roger Cohen, The New Republic. "The story of Madeleine Albright's life and ascent to power is a fascinating one in Michael Dobbs's capable hands." -- The Cleveland Plain Dealer. "Illuminating and generally even-handed" -- The New York Times. "An astonishing job of research." -- Richmond Times-Dispatch.